VICOM has announced the availability of the 598A pulse/CW frequency counter with peak power from Phase Matrix, a leading developer and manufacturer of high quality, cost-effective microwave and RF instruments. Providing automatic acquisition and profiling (both frequency and power) with the broadest frequency measurement coverage, the 598A pulse/CW frequency counter is a fully functional pulse/CW counter available with an optional internal delaying pulse generator for the ultimate in ease-of-use, practical peak and CW power measurements. This counter is ideally suited to such applications as chirped radar characterisation, carrier frequency measurement, pulsed radar analysis, VCO measurements, and frequency agile system analysis up to 170GHz. 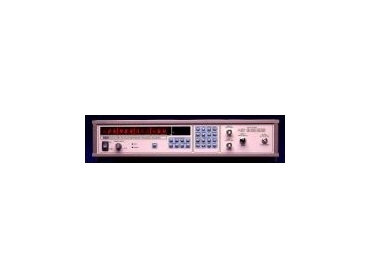 The 598A extended frequency capability enables CW measurements from 100Hz to 170GHz, and pulsed measurements from 250MHz to 170GHz. Parameters such as frequency, power, pulse width, pulse period, or PRF can all be measured fully automatically. The 598A will detect and measure CW, frequency modulated, amplitude modulated, or pulsed RF signals with pulse widths as narrow as 50ns. * Pulse and CW frequency measurement to 170GHz. Automatic pulsed millimetre-wave counting up to 170GHz can be achieved with the addition of the Model 890 cable kit and one or more harmonic mixers. Large amounts of "chirp", often encountered in millimetre-wave signals, can be precisely counted using center frequency mode. * Peak power measurement to 26.5GHz. * Built-in pulse profiling (optional) makes frequency and power profiling, simple and automatic. * 200W (+53dBm) burnout protection.